Liar’s Poker is a fantastically written expose on Salomon Brothers, the powerhouse of sales and trading in the 1980s. A cross between an autobiography and a contemporary history of the bond markets and Salomon’s place within them, the book gets to the heart of what it is to be a trader. I rate this book 4 / 5. Lewis begins Liar’s Poker with his experience getting recruited into the firm and his experiences with the training programme. He explains his experiences in trying to get recruited into a corporate finance (i.e. investment banking) job without success in a chapter aptly named ‘Never Mention Money’. Lewis then walks the reader through his experiences in the Salomon training programme (though it was a bit strange that he dedicated the same amount of time describing this as he did his actual experiences on the trading floor). There is then a slightly awkward shift in the book to a history of the mortgage trading department at Salomon Brothers, the most profitable section on the trading floor at the time (though this seems to be contradicted in Roger Lowenstein’s When Genius Failed which gives the honour to The Arbitrage Group). While the history of the mortgage trading department becomes fascinating as you keep reading through it (3 chapters), there is a real disconnect with the first section of the book. Recently I started to look into my superannuation to see whether there was any way I could do things more effectively (from a fee, returns, administration and tax perspectives) and I thought I would blog about it as I went. However I realised that many of the readers of this blog are from overseas and would not know how the superannuation system worked so this is a brief overview. In Australia the government mandates that employers contribute a certain amount, currently 9% per annum of an employees wage towards a retirement account which cannot be touched until the employee gets to retirement. This retirement account is not managed by the company but rather can be managed by the employee themselves (called 'self managed super funds') or by a superannuation fund manager (which are generally split into fee paying funds and industry superannuation funds which charge no fees). It is actually quite a complex topic which is why most Australians dont really think about it too much and just allow their employer to put the money away every month into these accounts. This is actually a problem as most people have several accounts (I am in my mid 20s and I already have 3 superannuation accounts - each one set up by a different employer). The superannuation system is actually a brilliant one. We have all read the statistics on how people do not save adequately for retirement and then government social security and pension systems are burdened and are in danger of going bust. The superannuation system fixes all of this as a person working for ~40 years with forced savings of 9% of their wage for this whole period will not be a burden on the system at all (and it is compulsory for everyone). There is also a knock on effect to the stock market. As most superannuation funds only invest in Australia there is a huge pool of money which is constantly searching for a home and which has to be invested in the market which I think adds stability to the system. While these are very serious issues with the potential to seriously affect investments and investment returns the impact that they are having on world markets seem to be overdone. When news such as this hits a domestic retailer / industrial company in Australia or the US which has absolutely no earnings / supply or any other ties to Europe then there is the potential to profit from 'Mr Market' being irrational. Each investor is different and will prefer to invest in different category. The first category is the least likely to be affected in the short run but will not get the same 'bounce' when the investment return eventually returns to normal. The second and third categories are where investor judgement comes into the picture and is also where the biggest profits are likely to be made. If the investment world is placing much higher 'worst case scenario' than you think then you would buy these stocks, wait for the worst to happen or for the situation to muddle through and then take a massive profit once everything returned to normal. The last category will probably be reserved for investors that are the most sophisticated. Those that are best able to judge the situation and able to take advantage of whether the market goes up or down. Stocks that are particularly leveraged to debt markets. Even if stocks have no earnings links to Europe they may be impacted by the effect that a European crisis has on funding markets. These include banks which are particularly dependent on overseas funding markets (note not all banks fall within this category). It also includes infrastructure type assets, utilities and other highly geared assets. If funding markets dry up then their cost of debt is going to soar. Note that as mentioned above it is entirely possible to make money from all the above type of stocks but it requires a detailed knowledge and research of each individual company to see whether the market is painting them with a broad brush (e.g. whether the market assumes that because they are a bank they are going to suffer even when they have more than enough liquidity and can tap funding markets even in stressed situations). This is the eleventh post in my Investing in Real Estate series and will deal with how to choose a property manager and how to negotiate the fees you pay them. In my last post I covered the decision to either use a property manager or to self manage a property. I personally use a property manager so will be blogging about them. I will not blog about self managing your investment property because I have no experience in it. Choosing a good property manager is one of the most important things you can do. Property managers will often either make or break your investment property (quite literally and also from a financial point of view). If you decide to appoint them there is a level of trust that is involved because they will be looking after what will probably be your single largest investment. Don't just use the agency that sold you the property It may turn out that these are the best property managers as well but more often than not they aren't. The fact is that they will try and pressure you into a property management agreement if you buy off them - resist this temptation and see several property managers before you appoint one. This is not a 'set and forget' type of arrangement You want the property manager to constantly be on top of the issues. A couple of slip ups is normal (especially over the course of a few years) but if anything major happens do not be afraid to switch. Other ancillary fees: Watch these fees! There are often fees for things like sending out statements, advertising, renting the property for the first time, contract negotiations. Most of them can be eliminated or brought down substantially. For example the standard form I was given had both advertising fees for the property and an initial fee of 2 weeks rent when they got a tenant. I reduced this to no advertising fees and 1 weeks rent when they got a tenant and they did this with no argument. Exit conditions: You want to be able to exit this contract at any time. A lot of property management agreement have minimum notice periods of like 1 - 3 months. You can (and should negotiate this down to nil). If they are not performing you should be able to move unilaterally. Other landlords (like myself) prefer only to be informed of the big things. I let my property manger know that I did not want to be called in most situations and that I wanted them to deal with most of the minor issues that arise. Also set parameters and expectations around things like repairs. If you're a handy type of person and want to do any repairs yourself then make sure your property manager knows this. As I am rather time poor I let my property manager know that if the repairs are going to cost less than $500, to just do it and send me the bill (I always check the bill to make sure I'm not getting ripped off). These initial discussions about what you want and the level of communication you desire make a big difference in how effective your arrangement with your property manager will be. For the first couple of weeks and months expect teething problems. No one is perfect so if your funds don't hit your bank account the first time don't stress and look for another property manager. Just contact your one and tell them you expect it to be sorted out. If these sort of 'administration problems' continue beyond two months then you need to sit down and make sure your initial expectations were understood. If things then do not improve consider changing property managers. Note that these two businesses were just so amazing that I wanted to give them some free advertising. You always hear when people have bad experiences but not when they have good ones so I hope they get some business out of this post. I was in urgent need for a new pair of glasses after I could no longer wear contacts for medical reasons so I went online searching for a pair. I had in mind quite a definite pair that I was interested in (a pair of thick framed Ray Bans). I decided to visit Noble Optical (my local optician) which has been run by the same guy Adrian for as long as anyone in the area can remember. It turns out he had what I was looking for in stock for a sticker price of $200 - $250 for the frames so I thought he would never be competitive. He cut the frame price to $100 for me and charged only $80 for the lenses. He then went one better but taking an extra $20 off so that it was fully covered by my health insurance. I paid half of what I would have paid online. I do competitive rifle shooting and so go through a fair bit of ammunition which is one of the main costs involved in the sport. Given the restriction on guns and the strict gun laws in Australia the major gun shops charged an arm and a leg for most decent ammunition. The cheapest way that I had originally found was to buy them through your local club which tended to provide them for a much cheaper price. I thought it may be worth trying to buy the ammunition online from the US but after seeing the amount of effort to get the stuff legally into the country it just was not worth the effort. I found this online store - Ammunition Galore - which provided cheaper prices for ammunition than almost any other supplier around. You may say that this proves that online is cheaper but it is not your typical online store. It is actually just a local guy that imports the stuff and sells it out of his house. If you live in Melbourne and shoot it is well worth the drive. Also if he doesn't have the ammunition he is more than willing to order it in. He also has tested everything he sells so knows what he is talking about and he is cheaper than anywhere else. I know I'm probably late to the party in terms of ripping the Facebook (FB) valuation to pieces but I wanted to see where the stock traded during the first couple of days of trading before declaring that we were back to the same valuation silliness that we saw during the Tech boom / bust. Given FB's tragically poor performance during the first few days of trading I'm happy that the stock has plummeted because it shows me that the market is not going crazy again. I confess that the valuations surrounding the whole list of social networking stocks (including Facebook, LinkedIn and RenRen to name a few) has never made a whole lot of sense to me. The idea of valuing a stock on a 'number of users' is akin to the old 2000s methodology of valuing a stock using 'number of eyeballs'. While there should be different techniques to valuing stocks in different industries, valuations should always come down to the earnings of a company. Traditionally 'new industry' companies have been valued at much higher multiples than their industrial / resources / financials counterparts because of the 'blue sky' factor. That is the potential for these companies seems limitless and given that the price of the company should be the future value of its cashflows almost any valuation can be justified with enough imagination. The problem all to often is execution. Although some companies are able to execute on these visions and justify their huge IPO multiples (Google particularly comes to mind) most are never able to live up to the expectations. Why the shares were ever in short supply is a mystery to me. The valuation proposition never stacked up. I think that perhaps people were hoping to make stag profits on the shares and so didn't care too much what the underlying fundamentals are. This only works if most people in the market are dumber than you which is always a losing strategy. I think FB was always a flawed investment and it needs to show that it can effectively monetise it's users before it can ever be considered a good investment. How people can buy into FB before Google (which actually makes money) is a mystery to me. Disclaimer: I do not own either Facebook or Google. Monkey Business is a funny, outlandish and surprisingly honest insider’s look into life as a junior investment banker. For any junior investment banker who reads this book, you will be able to relate to 90% of this book straight away and for any student who is considering pursuing an investment banking career (undergraduate and MBA alike) this book offers insights and warnings about the life you are letting yourself in for. I rated this book 5 / 5. The book follows a chronological timeline of Rolfe and Troob’s journey through their associate investment banking career at DLJ (since acquired by Credit Suisse) from the MBA and recruiting processes, through the summer associate program to life as a full time associate and then their experiences leaving the investment banking world. · What does a junior banker actually do? · How does the investment banking hierarchy work and what role each level play (from the analyst monkeys, to the Cro-Magnon man associates, to the processing robot vice president and above)? · Why do investment bankers get paid so much? · Why is turnover so high at investment banks and when do you decide to leave? I was recently speaking to an acquaintance that works for a rewards programme of a major credit card provider and he made an interesting statement. He said that you should always take the store gift card as your credit card reward and never ever take the cash or products. I confess that I had never really thought about it too much. I had two rewards programmes. One with a credit card that I wanted anyway (that happened to come with a rewards programme) and the other with a corporate Amex card which my employer gave to me where I was allowed to keep the rewards points. However after he made that statement (and me figuring he knew what he was talking about) I decided to look into it and it turns out that he was absolutely right. Rewards program cost = 177,600 points. The mark up on these products has to be seen to be believed. I tried this on both my Amex rewards as well as my Commonwealth Bank rewards and the outcome was the same (Amex offered better deals for grocery cards vs retail so look to see what your provider offers). The best strategy therefore is to buy the cards that offer you the best value and either buy other things you need with them and use cash to buy the item that you originally wanted OR exchange them with others who want them for cash. One of the earliest missions I went on with this blog was to find the best value broker around. They not only needed to be cheap but they also needed to offer the full suite of investment products. I ended up settling on Interactive Brokers and I have been surprised at how good a trading platform it has been - in fact I would recommend it to anyone who is serious about trading. One of their enduring faults however (as I have posted about before) is their inability to participate in dividend reinvestment plans. While this has annoyed me it has never caused me to want to use my other broker who is much more expensive (an Interactive Brokers trade costs me A$6.00 for an ASX trade and costs me A$29.95 with Commsec - my old broker). Late last week however I came across a situation which caused me to rethink this 'cheap only' policy and I actually used my old Commsec broker. I realise that this is a very simplistic comparison and that if the stock price went down over the period that this would influence the decision and also that it depends on the return that the cash dividend would get vs the stock. I would argue however that an 8.5% yield is pretty hard to match with any other instrument or stock with any degree of certainty so assuming the stock price didn't move this would be a much better yielding investment. I should also emphasise that the smaller the value of your trade the less significant this difference is going to be. On a $1,000 trade the value of the dividend discount is going to be totally outweighed by the trading cost difference. On a per annum basis the difference is minimal (less than 0.2% p.a.) but if you already have a trading account set up the consider keeping it open. This is especially true if your broker does not charge you fees if you don't trade and allows you to participate in these types of issues. If anyone would like me to do it - I can upload an excel file with a more robust calculation so you can see when it is an advantage to trade through interactive brokers or your own broker in situations such as this. The cost of property managers is tax deductible. If you happen to get a bad property manager things can go wrong very quickly. They may advise the wrong tenants or may fail to follow up on property inspections and rent reviews. Should I self manager my property or use a property manager? However if you are a handy type of person (and perhaps are the stay at home partner of a couple so your opportunity cost of time is relatively low) then self managing your property may result in much higher long term results. You do have to read up on all the relevant laws regarding tenancy and the rights and obligations of both the landlord and the tenant in your country and state. Bucks weekends (or even just a single night) are one of those events that typically do not come cheap. This is especially true if you do all the 'regular' bucks activities in the regular venues. I know bucks that have done trips to Vegas, Hong Kong, the Gold Coast (for Australians) and everywhere in between and everyone has a great time though laments after the fact how much money they wasted. Everything else should be considered an extra. I have outlined a 9 step checklist to plan activities that should not break the bank. I'm going to assume that there are approximately 10 guests and ever guest is paying their own way. I am also setting a budget of $300 per person for the whole weekend (if you think about how much gets spent on a weekend in Vegas / HK / the Gold Coast including flights / accommodation / alcohol / partying etc you will realise how cheap this actually is. Pick a location that is not typically thought of as a party location. The fact is that when you're a group of 10 drunk males it doesn't really matter where you are. You are kidding yourself if you think that in that state you're going to pick up women and bring them back to the share house. Get every person to bring their own alcohol on the way up ($50 per person, $500 total). This avoids the problems associated with you buying $500 of beer and there being some spirits only / wine only drinkers in the group. Bars are also way over priced so if you can have the party at the house then you are much better off. Don't buy too much food! This is a bucks weekend. All you need to bring along is eggs, bacon, bread, cereal and milk for breakfast and some snacks (~$100 total). When I went away this is all we bought and we had HEAPS left over at the end. For all other meals go to a winery / order pizza or fish and chips in (~$200 total) Guys really don't care that much for a bucks weekend so you should go overboard with meal planning. The person / people organising the bucks should have some pre-planned activities that will embarrass the buck. Public humiliation type activities are always fun (e.g. getting them to wear a mankini in public) but there are heaps of activities out there dedicated to activities. You should not have a rigid timetable but if things are starting to go quiet then pulling out one of those pre-planned activities is a good idea to get the party going. Drive if possible and take the minimum amount of cars necessary. For 10 people 2 - 3 cars is more than plenty and will help keep the fuel costs down. As I used less than half a tank of fuel on the weekend I went away I'm not counting this in the budget. The total cost of the above weekend is $3,000 or $300 per head. You would barely get flights and accommodation to Vegas / HK / the Gold Coast for that kind of price. There is so much fat in that budget that you don't really need to skimp on activities. I just had a look at the kind of places you could get for $800 for a weekend and there are some amazing options out there. When Genius Failed is a comprehensive look at the amazing rise and fall of one of the most noted and hyped hedge funds of all time. This book severs as a warning to all investors about the risks of leverage and hubris. I would rate this book 4.5 / 5.0. Long Term Capital Management (“LTCM”) was a fund set up by the superstars of finance including the rainmakers from Salomon Brothers (then the premier Wall Street trading firm) as well as stars from academia including Robert Merton and Myron Scholes. LTCM was considered absolutely foolproof by investors, Wall Street counterparties as well as the fund managers themselves. As I mentioned in my April 2012 expenditure review post I am going overseas at the end of this year and have been looking into the most efficient way to take funds with me. When I have travelled previously I have used a combination of cash / travel card / credit card and debit card (I have never used travellers cheques as they never seemed to stack up for me). At the very minimum I carry around A$500 (~US$500) in the local currency when I travel. About $350 of this is as a float which I use to spend on various things and $150 is in different currencies (I have US dollars, Euros and Canadian dollars) as an emergency fund (I chose currencies that I figure will be accepted in every place in the world). I am going to cover the relative pros and cons of each of the above options (excluding travellers cheques which I have never used) below. Having used all of the above options I have more recently started to use a combination of credit cards and debit cards. If you find a credit card that has very low fees for overseas transactions (for example for Australians the GE Finance 28 degrees MasterCard has no annual fees, no currency conversion fees and no international transaction fees which makes it perfect for international travel) and combine this with a debit card which you use to withdraw large amounts of cash at a time (e.g. $1,000 every few weeks) then you can keep the fees to a minimum. Having used the ANZ travel card I found that I did not like the travel cards very much. Any certainty I had around exchange rate was far outweighed by the exorbitant fees. Further exchange rates can move in your favour and you lose the benefit of this with a travel card. I also lost significant value taking money off the card at the end and it expired after 2 years which meant that I could not even keep it for travel that I was planning to do in the future. Also in some places the travel cards are not common and there is a bit of a hassle getting them to accept it. Overall it is not worth the effort in my opinion. Disclaimer: I get absolutely nothing for promoting the 28 Degrees MasterCard. I just think it is a great product which I found recently and will be signing up for in the next few months. A question I often get asked by my friends who want to start investing in stocks is "what shares are good value?" or "what shares should I invest in?". I think this is fundamentally the wrong question to be asking - especially if you are just starting to invest. The right question should be "how do I generate an investment thesis which will lead me to shares to invest in". The above question is the right one to ask because then you will start generating ideas that you understand. The problem with taking another persons suggestion (whether it be a friend, broker report, accountant or any other advisor) is that, without even realising it, you are buying into their view of the world (and especially of the investment landscape which you may not believe in). I have outlined a few steps below which hopefully will help you generate your own investment thesis and should help generate lists of stocks for you to investigate further. Note that this is not the end of the process! This will only generate a list of ideas. You then have to do the appropriate amount of research on your stocks. I have posted on this before so please don't generate an idea and then just go out and invest in it - it may be a perfect thesis but everyone else may have already recognised it and the stock will probably be too expensive. This is not a new idea. It is one that Warren Buffet stresses all the time. For a really detailed look at how you can spot ideas yourself I highly recommend the book "You can be a stock market genius" by Joel Greenblatt. I have linked to this book on the left (if you want to check out fishpond / book depository for pricing there are links on the right of my blog). All of us have certain industries we understand better than others. For most people the simple ones are things like retail banks, retailers (both staples as well as things such as clothing / electronics), many Internet companies, clothing manufacturers. We have a detailed understanding of these industries because we (like most people) use them every day. However there are some industries that you may understand better than others. For example if you like to gamble at the casino you will understand that industry a whole lot better than I will because I don't go very often. Doctors / nurses will have a much better understanding of the health care industry (as well as the biotech industry). Financial professionals will understand the investment banks / fund manager space and the things that drive that. If you're a builder there are building materials companies as well as home builders and property construction firms. After you have made a list of things you understand be on the look out for investment ideas. Often you will see trends before the financial professionals become aware of them. For example if you are into fashion and you see a new trend start to emerge and you see the company who is at the forefront of that trend. Chances are that the people that work in the financial world have no idea of this emerging trend and will only start to find out once they start making real money. If you're a builder and you see demand really start to pick up chances are you are going to see this before the data is released to the financial professionals. It is all about using your individual knowledge. There are so many situations like the two above that it is hard to mention them all. The key is to constantly keep a look out. In the first two points I have really stressed areas where you deal in it personally and are able to see the trends before others. However you can also make money by looking at a situation differently from others. You may read something in a newspaper or a magazine article which has nothing to do with stocks but it may cause you to think of an idea or to research something further and go against the grain. I have said it before but going against the market is the hardest thing one can do. For example: During the GFC all financial institutions and highly leveraged companies were being battered because debt was not available at any price. There were news articles on a daily basis about the external funding markets drying up and banks with exposure to the US and Europe being in real trouble and going bust. You could look at this idea and decide to stay from all banks. Or you could look at these articles and look for those banks which primarily funded their book domestically and lent money domestically. In Australia you would have come up with Commonwealth Bank of Australia which is the largest listed local bank and invested in them as the price had gone down substantially for no reason related to the stock itself. Ideas don't even have to be that complicated. One I invested in was much simpler. I read an article in 2008 talking about diamonds and how they were so cheap because Indian suppliers were flooding the market but no new diamond mines had been discovered in the last 10 years so the price should recover at some point. I looked around and all diamond miners share prices were suffering even though it only appeared to be a short term problem. All I had to do was find one with a good resource that didn't have too much debt and wait for the market to recover which it did within a year. If you are going to invest successfully then you need to do the work. Research your idea or thesis thoroughly and make sure that it stacks up. After this research your stock and make sure that the value proposition stacks up. Following the above advice should have you generating a list of ideas in no time. Not all your ideas will be good ones and that is why the necessary research is required. I try for one idea per month. This may not sound like a lot but if you think about how much money you have to invest - you do not need a whole lot of ideas to start investing. This is my ninth post in my Investing in Real Estate series and covers things you should check when buying a property. This is one of the most important steps in the process however is the one which is also the hardest to carry out. You have found the perfect investment property, have your finance in place and have gone through the stress of negotiation with the other party saying yes. If you have gotten to this stage well done! However the most important part of the process is the due diligence. It allows you to carry out the terms you and the vendor agreed to in your contract before there is formal settlement of the property. It is the hardest stage because by this stage you cannot help but be emotionally involved. However you need to try and detach yourself because if there are real problems with the property (e.g. structural problems) then you need to back out pretty quickly or you will have some serious problems in the future. The due diligence that you do is totally dependant on what you put in the contract. At the very minimum you should include a building and pest inspection clause. Do not use the pro forma wording that the real estate agents suggest. Use wording that is as unambiguous as possible for this. I suggest googling around for appropriate wording - I am not a lawyer and do not want you using a broad suggestion that I put on this website in a contract. For your building and pest inspection use a reputable building inspector. You want a person to tell you the truth, not what you want to hear (i.e. that it is perfect). In Australia a lot of investors and home buyers use Archicentre. I have never used them though I have heard from friends who have that they are not as detailed as they could be. They do not tend to get right into the property to find any potential flaws. I used a person recommended to me by a real estate agent friend. He said that this person was hated by real estate agents because he found every single little problem and caused people to back out of contracts. Make sure you tell the inspector that you want to hear about everything. A lot of inspectors are reluctant to give you that information because they fear you will sue them if they get their estimates wrong etc. If you make clear that you are just trying to put things in perspective I have found that they are normally very good. This is a bit of legal due diligence that you should never skip over. Ensuring that the vendor has the right to sell you the property before you hand over the cash is essential. This is often done by a lawyer or a paralegal. People often argue about whether it is better to use a lawyer who tend to be more expensive however have a better understanding of the law if anything goes wrong or a paralegal who do this as their bread and butter work every day, are cheaper though will not be able to help you as well in a bind. My personal strategy was to use a paralegal (Moira Ryan - I highly recommend her if you are buying a property in Victoria, Australia) who came very highly recommended but to have a lawyer in the back of my mind (I didnt retain them) just in case things went a bit pear shaped. I found this worked perfectly for me as most times there are no real issues. Contractually representations made before signing the contract but that are not in the contract do not count for anything. For example if the real estate agent has told you that this land is prime development land, you do not check and it turns out the council refuses to develop any land, if it is not in your contract then you cannot get out of the contract for this reason. There are an unlimited number of things which you can put in your contract for the diligence phase which can give you an out for things you are worried about. However keep in mind that more conditions are likely to make a vendor nervous about the certainty of the sale. The conditions above should never be left out so consider them an absolute minimum for your contract. Most importantly after they are in your contract make sure that you follow up on them in the appropriate amount of time and exit the agreement if necessary. Not exiting when you know something is wrong or too costly to fix is the biggest mistake you make. You wont catch everything but if you ignore information that you have been told then it is your own fault. Weekend Warrior: Visa or Mastercard? Does it make a difference? While I was doing research for a blog post that I want to write on credit cards I came across this great article written by the credit products review website Canstar. It was a brief article on the difference between Visa and Mastercard (and whether it makes any difference when you are choosing what credit card to select). Visa and Mastercard are actually only processing systems which allow the retailer to process charges from your financial institution. They actually have nothing to do with the issuing of cards or the payments that flow too and from you to the retailer. Nor do they have anything to do with your rewards programme, the fee you get charged or the interest rate you get charged. Given that both cards are accepted in over 200 countries and that most retailers accept either Visa or Mastercard it actually makes very little difference which one you have as there is unlikely to be a situation where one is accepted and the other is not (note that American Express does not have anywhere near this level of penetration and I have seen plenty of signs saying Visa or Mastercard only). Therefore it makes little or no difference whether you choose Visa or Mastercard. Much more important is the financial instution that you choose and the deals that they are offering for your credit card. ‘Who Moved My Cheese’ is a short (should take you no more than 30 – 60 minutes) parable like book about dealing with, and embracing change. I would rate this book 3 / 5. At the core of the book is a short story about two mice and two mice sized humans who live in a maze and have to find cheese every day. When the cheese in one location runs out the story has the mice run off in look for new cheese while the humans complain and bemoan the fact that there is no cheese left in them. The story has one human slowly embracing the need for change while the other is too scared and stubborn to change. This book is not necessarily about business but about change generally. To emphasise this point the author includes a post script to the story where group of friends are chatting about the lessons they took from the story with some applying the lessons to their career, business and even relationships. Health insurance, like investments are one of those products where your own personal situation determines the health insurance that is right for you. It depends on age, personal well being, as well as habits such as the amount of exercise one does as well as do you smoke etc. In some countries the health system is so good that private health insurance is unnecessary. In Australia the public health system is free and very good however there is a major tax penalty for not having health insurance if you earn above $80,000 as a single or $160,000 as a couple (1% extra tax). In other countries the health system is such that it is almost essential to have health insurance to be able to have peace of mind that they will not be sent broke if they ever get sick. The issue of having adequate cover was brought home to me because someone close to me was diagnosed with cancer and thankfully they had the right level of cover which meant that we were not worried about the financial side of it at all and the health insurance fund that we had was great (it was HCF). Extras are where the bells and whistles come in: Generally speaking if you have the same level of hospital cover at different funds the prices will be pretty similar. Health insurance funds tend to differentiate themselves with the extras. Extras are however the things that are most subjective. Always check the exclusions: Exclusions are almost always in the fine print that no one wants to read but you do not want to get a serious illness and then find out that you have been paying your premiums for years for no benefit. For myself - I try and make sure that the really obvious things are not excluded (cancer, heart disease etc.) and at the same time try and find an insurer which excludes as little as possible. Now that you have found several policies that you think work for you on hospital cover and the exclusions are not too bad then the next step is to work out how much you want to pay for the extras. I listed a few questions below which should help narrow the field. I normally try and avoid posts which are very specific to one country / region because in fact most of my readers are not from my home country (Australia) but are spread across the world. However at the same time this is a blog which also tracks my personal finance issues and as such sometimes this is unavoidable so this will be one of those posts. Cuts in public sector spending: Canberra is going to be affected quite significantly with the significant budget cuts to public sector jobs. Again this does not affect me a great deal. If you have a family or are a lower income earner this budget should benefit you significantly. However if you are like me and are trying to build wealth it doesn't really do anything for you. Going through the budget in detail helps you understand a lot of what the news articles are about so I recommend this to anyone who is interested to know how their position is likely to change over the next year. In terms of investing in Australian companies - nothing in the budget should make too much of a difference. Nearly all the provisions were already flagged well in advance (such as the mineral resource rent tax and the carbon tax) so these have already been priced into the equities. Investing in Shares: How often should I check the value of shares in my portfolio? In this post I thought I would answer the question - how often should I check the value of my shares and the portfolio. Most people when they start investing in shares feel the need to check how their investment is going every day. This, however, is not what you should be doing. One of the hardest psychological aspects about investing in shares is that the price is always available. It create the temptation to look at the share price to see how we are doing. If you compare this to other investments (such as property) which are illiquid the temptation to constantly look at the price is just not there because the information is not there. The answer then is to only check the value of the share portfolio when you are reaching a decision point. If you have bought the shares for a good price (having done all the necessary analysis and valuations) and you know what you think the shares are worth then you only need to know whether the shares are getting close to this 'fair value' that you have ascribed to it. There are plenty of stock broking programmes that will send you an email / sms alert when the shares hit certain prices and it is very easy to set up. The other time you should check the price is when you are updating your valuation for results / announcements or any other new information that comes to the market - this is the time that you will discover if you have paid too much for your shares and if they are trading above your new valuation then it is time to sell. 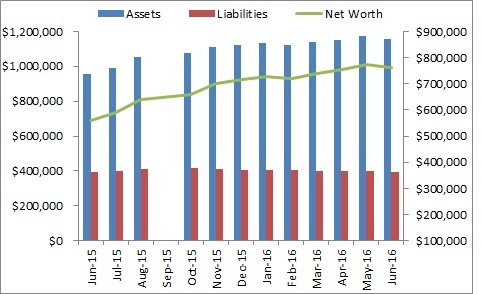 I check my share prices about once a month when I go to update my net worth for this blog and whenever I am updating my valuations for the shares I own. I found that once I have owned a share for a significant period of time (i.e. more than about 18 months) the temptation to check the share price almost vanishes. This is not great either as you need to be aware of whether it is time to sell or even perhaps add more to your portfolio. The advantage of having a system of when to check the value of your stocks is that it removes much of the emotion involved in investing. You don't really care what the market is doing because you're not checking it constantly and this allows you to be a more patient and successful investor. This is the eighth post in my Investing in Real Estate series and will answer the question: How do I get finance for my real estate investment. I should stress beforehand that I will be writing this from the Australian perspective however many of the tips and advice is generic so can be followed anywhere. Getting finance for a real estate investment in an ordinary market environment (i.e. not one where there is a real estate crash) should not be a difficult ordeal provided that you have done your work in advance. There are several things you need to do both before and after you put an offer on a property. Get pre-approval from your lender: Subject to finance clauses always spook people selling houses. If you can avoid putting one in because you know that you are going to get the finance for the deal then it makes the buying process much easier. Do a price comparison between banks before you go to one: Doing your research online is easy and make sure you have all the relevant information under your belt when you go to see a bank. This includes knowing things like their standard rate, any fees for things like re-draw facilities and fees for early exits and paydowns. Do not be afraid to negotiate: When you have sufficient information you should not be afraid to negotiate. Banks want your business and will almost always offer you great deals if you ask for it - this includes lowering the standard variable rate (in Australia if you borrow more than $250,000 they will normally give you 0.6% off easily), waiving of fees and other benefits. You need to know what comes as standard so you don't think you're getting a special deal when in fact your not.